Ballots for the national, Los Angeles and New York elections were sent to members on July 25 and are due by Aug. 24. Those results will determine who will serve both in key offices, including president, secretary-treasurer and most board positions. In October, members will hold the SAG-AFTRA convention, where they will elect an executive vice president and seven vice presidents. SAG and AFTRA merged five years ago and the marriage has not been the most harmonious. Esai Morales, a current board member best known for his role in “NYPD Blue,” faces incumbent Gabrielle Carteris for the presidency. Carteris was named to serve out the term of Ken Howard in April 2016 after Howard died. Stuntman Peter Antico is running as an independent. 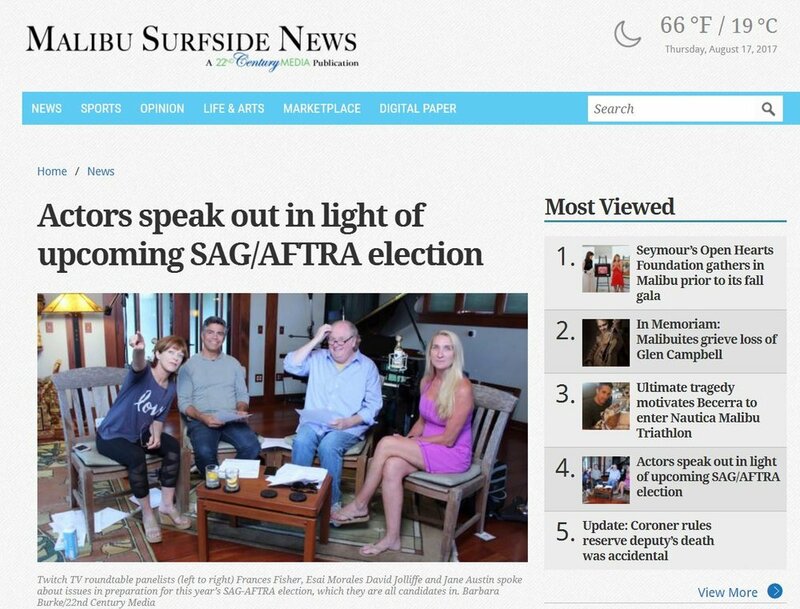 At the Malibu event, Morales, stuntwoman Jane Austin (candidate for National Secretary-Treasury), actress Frances Fisher (a local board candidate), and actor David Jolliffe (candidate for LA Vice President) sat down for a roundtable discussion aired live by Twitch TV to discuss key election issues. Others spoke in support of the Membership First slate. The Hillary/Trump fiasco isn’t the only presidential race with all the makings of a reality show. The mud-slinging, press conference brouhaha’s, hotly contested issues, fiercely divided camps, etc., aren’t just reserved for Washington. There is another altogether insane presidential race, and the similarities to what’s currently happening in our nation’s capital are striking. The fight for the SAG-AFTRA presidency has become one of the more ugly Hollywood power struggles in recent memory. However, if, due to a few other minor distractions in the daily headlines, you haven’t been paying too much attention to this one, don’t worry. You’re not alone. Let me bring you up to speed. After the 2012 merger of the two largest entertainment unions, the Screen Actors Guild and the American Federation of Television and Radio Artists, things began spiraling downward at a snowball’s pace. And it appears they’ve finally come to a head in this election, due primarily, to the essential divide over one, basic principle: To Strike or Not to Strike?